I'm starting to get that feeling that summer is winding down. There are no sad feelings because I have been able to enjoy some super sweet moments with my family. Watching Riley change from a baby into a boy has been fascinating and terrifying and more wonderful than I could have ever imagined. He loves bugs, roaring, making up stories with us, and talking non-stop. There is never a dull moment and even though it's exhausting there isn't a moment I would trade. Sometimes, in the midst of it all, I neglect to put together a healthy and complete meal for myself. On those days when I'm lost in the wonder of watching a little boy explore the world around him, this whole grain salmon & avocado bowl is a serious lifesaver. There are no frills with this one-bowl meal but I did make one change to the typical rice bowl: instead of using white or brown rice, I used a whole grain medley. Most grocery stores sell whole grain medleys in the rice aisle or the bulk section. The particular one I chose to use was a combination of brown and wild rice, bulgur wheat, and quinoa. The combination of textures and nutty flavor is perfect with the flaky salmon and creamy avocado. For a little brightness, I added some simple pickled red onions but you could use any kind of pickled vegetable you like. This time of year would be the perfect time to try some pickled zucchini. It can be so easy to fall into the black hole that is "convenience food" that are often filled with sugar, bad fats, and ingredients that have been so far removed from their natural state that they have no nutritional value left. This whole grain bowl is convenient (make a large batch of the whole grain medley at the beginning of the week to have on hand), versatile, fast and so healthy. And the biggest reason to make a healthy lunch like this for yourself? It will help you enjoy every moment of your day, whether you spend with a toddler or not. Begin by heating the olive oil over medium-high heat. Meanwhile, season the salmon with salt and pepper. Place the salmon in the pan and cook until golden brown, about 2-3 minutes, then repeat on the second side. Cook until the salmon is just opaque in the center. 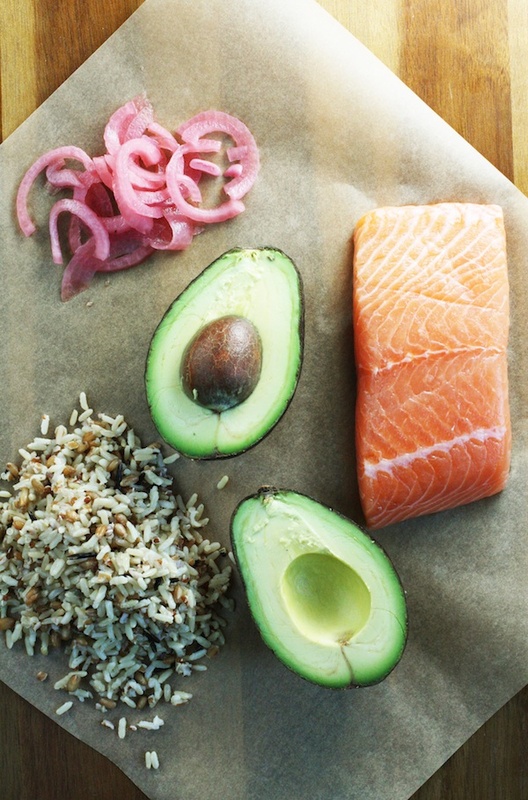 While the salmon cooks, put the whole grain medley in a bowl and top with the salmon, avocado and pickled onions.